August 5th marked the start of the Saints sixth of eight regular season home stands at CHS Field in 2015. The local nine once again took care of business on the field, sweeping both teams that visited St. Paul. And even though the Entertainment Team lost a key member and fan favorite, they were still able to deliver fun galore to everyone in attendance. Add all this together with what happened a couple days ago, and I'd say it's been a pretty good season so far. 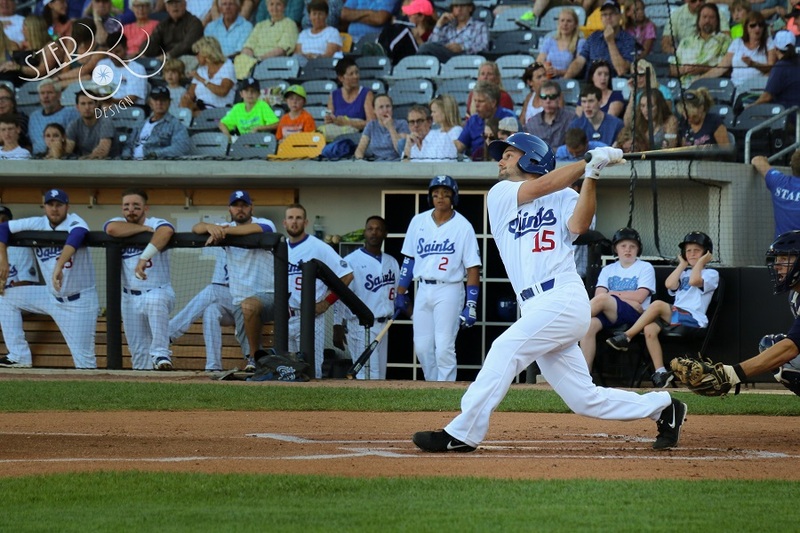 The Saints swept both the Lincoln Saltdogs and the Winnipeg Goldeyes during their last stand in Lowertown. In the process, they dropped their “magic number” to two. Awesome starting pitching, a shutdown bullpen, and clutch hitting were the keys to victory for the home team. My MVP for the stand is Robert Coe and Angelo Songco. Once again, I couldn't narrow it down to just one player. After you look at these stats you'll know why. To say Coe's week was dominant may be an understatement. He went the distance in his first start allowing only one hit, a leadoff single in the eighth. Prior to that he had a perfect game until his only walk of the night in the seventh inning. His second start was almost as impressive when he went seven innings allowing three hits and his only run of the home stand. On the other side of the diamond, Songco continues to punish the baseball whenever it's within his reach, scoring at least one run in five of the six games and racking up a couple of four-RBI nights. His two home runs during the stand tied him for the team lead with Vinny DiFazio at thirteen on the year. There're quite a few scary guys in the Saints right now, but I think Angelo would be atop my “stay the hell away from him list” if I had one. Another homestand, another record broken at CHS Field. On Monday, August 10th the Saints set a new season attendance mark at 299,093 fans. This record was one we all expected to fall; the new place holds a couple thousand more fans than Midway did. But breaking it in only 37 games? That's just crazy support for a great team and an outstanding, beautiful new ballpark. We should all be proud as heck to be part of such a great year at our new summer home. The Entertainment Team suffered a rare loss Saturday night as PA Announcer Halsey Lindquist worked his last game with the Saints. Halsey and his family are moving out of state to greener pastures. He will be missed for being a charismatic, crazy dancing, ball of "Fun is Good" energy. His chemistry with the staff, and especially with partner in crime Lee Adams, was brilliant. I think the tattoo he has on his arm sums up his attitude and how we will all remember him perfectly. It just says, "Be Happy". And that's what he always was and what he made all of us over the last couple seasons: happy. We're gonna miss you Halsey, good luck! After Monday night's game the team traveled to Sioux City for a three-game showdown between the top two clubs in the league. The Saints and Explorers split the first two games of the series. Then prior to even playing Thursday night's game…Ladies and Gentlemen, you’re 2015 American Association North Division Champion, St. Paul Saints. It has a nice ring to it doesn't it? On August 13th the boys clinched the crown when Winnipeg lost a matinee game to Sioux Falls, mathematically eliminating the second place Goldeyes from contention. Following a small pregame celebration the boys continued on their road trip with one more game against the Explorers. The Saints unfortunately lost the last game 4-3 and the series 2-1, which ended their season-long series unbeaten streak. Next up the team traveled to Joplin for a three game set against the Blasters. After dropping the first game the Saints rebounded, winning the final two of the series. The team is now 19-1-2 in series this season and 61-19! The best team in the league returns home starting Tuesday, August 18th. The Sioux City Explorers (I think I smell revenge), and Sioux Falls Canaries both visit CHS Field for three games apiece. The road to the title has been a record-setting one for the Saints, filled with so many past marks blown away by this year’s team. But with one goal in mind all the other stuff doesn't seem to matter. This team has a desire to win for each other like I haven't seen in a long time. Combine that with a crazy amount of talent and, well, the sky's the limit. As they continue to show. Promotional highlights for the home stand include, Star Wars Night (Aug. 18th), Mike Arbucke's induction into the Professional Scouts Hall of Fame (Aug. 21st), and CHS Field Replica giveaway (Aug. 23rd). With only two regular season home stands remaining you're running out of time to get in on this historic season at CHS Field. Click here to join the fun. It would be nice to see them cap off this memorable season with a championship. But, doesn't cheering for a championship go against the Saints vibe of "Fun is good"? Still it would be a shame if this club didn't get the title after the season they have had. I was just listening to 1500espn, and they announced that Nate Hanson has signed with the Saints. Nice signing for an already really great team.